Onto the next weekend adventure, Brussels, Belgium. If you think my title is odd… I do too. It’s all my brain could come up with. Since Belgium is just a hop, a skip and a jump away over the English Channel we decided to try a new mode of transportation, the chunnel. This 31.4 mile rail tunnel running under the English Channel runs from the Straight of Dover to Calais, France. We have been on the chunnel before to Paris 8 years ago as a rail passenger, this time we went with our car. So we basically drove our car onto a train, put the emergency brake on, trained under the water and popped up in France. Cool, just cool. And super easy, cutting out the whole airport check-in, security scan and squished airline seats. After we popped up on the shores of France we had about a 2 hour drive into Belgium. Since we were no longer in the UK, the country that decides to drive on the wrong side of the road, we now had our right side driver car on the right side of the road. Tricky, tricky. And fun fact, when you drive a GB (Great Britain) car into another country you have to get these little stickers to put over your headlights to change the direction of the glare, so you do not blind left side driving vehicles. Oh, and you have to have a breathalyzer test in your car at all times. Now you know. Our hotel was perfectly situated in a little square downtown right on the main drag with a pommes frites stand on one side, a chocolate store with a giant elephant on the other and THE SMURF STORE behind it (yes there was a Smurf store, more on that later). Come on, can’t you see the resemblance? As if the Smurfs weren’t cool enough, Brussels has a comic book route you can follow to see some awesome comic book heroes plastered on the walls of the city. I’ll sprinkle some in throughout the post, keep your eyes peeled. After we checked in and I browsed the Smurf store for an absurd amount of time, we headed to the La Grand Place square. And boy was it grand. With nearly 40 buildings from the 14 to 17th century lining it, there’s no question why it was selected as a UNESCO World Heritage Site in 1998. They hold an annual event each year in August where they create a flower carpet in the square using over 600,000 cut flowers. Pretty sure that’s on my list for 2017! Even without the flower carpet, it is stunning. He draws a crowd, that’s for sure. After that we hiked it WAY across town, probably too far to do one of our favorite things, a brewery tour. The Cantillon Brewery is a family owned brewery that was founded in 1900 and is to this day still making the traditional lambic, geuze, faro and kriek from the very beginning. It was awesome to learn about the historic distilling process and of course try some awesome lambic. I only wish the queen of Framboise was with me to try it, miss Lori Triplett. I have not even touched on the awesome grub Brussels has to offer. Let’s talk about pommes frites. I love a good french fry, and I hate mayo. But somehow in the magical world of Brussels mayo makes fries even better! Not pictured, the mayo, which I was skeptical of… oh, how wrong I was to be. And don’t get me started on the chocolate. Pretty chocolate, delicious chocolate, fancy chocolate, colorful chocolate, basically any type of chocolate you can dream of. I know, not chocolate. But delicious and pretty nonetheless. Then there is the beer… strong beer. They have a Delirium cafe in Brussels, which boasts more than 2,000 beers. So we stopped in to try some local brews. It doesn’t hurt that Delerium’s logo is an elephant (my fave). Our first day in Brussels was splendid. BUT Sunday started off even better with some belgian waffles on the steps of the La Grand Palace. After our sweet start we walked up to the Royal Palace of Brussels & took in a few sites. Then we headed over to the Belgium Comic Book Center to continue our education on Brussels comic book history. It was pretty awesome. I discovered some new comic strips, and I even got to go inside of a Smurfs mushroom (house). There was not a Smurf berry in sight… those stingy Smurfs. After taking in the history of comics we wandered around the city to take in some more sites, grabbed some more fancy chocolate to share with friends and enjoyed a drink in a really cool museum/public library/art center/bar. On the drive out of the city you cannot miss the Basilica of The Sacred Heart, so we had to stop. It is an enormous structure with a mile long green space stretching out in front of it. It was a beautiful day out so the park was full of kids playing soccer and parents chasing after toddlers on scooters. Sadly, just one week after our visit Brussels was attacked. I hope you will not let that deter you from making a trip to Brussels one day. Despite what the media makes it out to be, it’s a beautiful city full of wonderful people and scrumptious treats. I truly look forward to visiting again. Hopefully to see that giant flower carpet! 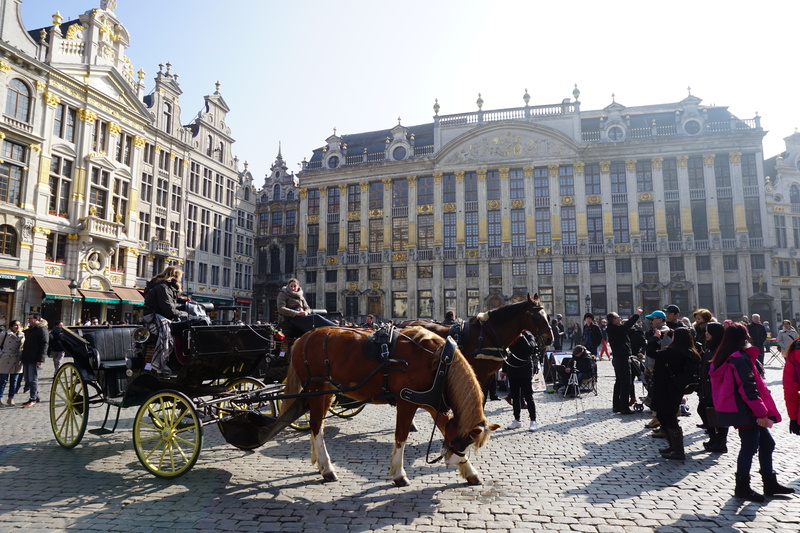 You can see more photos from our trip to Brussels on Flickr HERE. Thanks for sticking with me on my slow blogging journey. Next up is our trip to Prague, or as they say it, Praha. This entry was posted in Travel Adventures, Weekend Revels and tagged Adventure, beer, belgian waffles, belgium, brussels, chocolate, chunnel, comic trip, comics, delerium, framboise, pommes frites, smurfs, Travel, wanderlust. Bookmark the permalink.